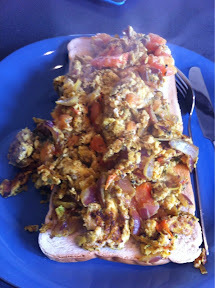 The husband still isn’t convinced of meatlessness as a good thing, but he doesn’t complain at these eggs. I like them for lunch, and they are the ideal using up the end of the ingredients before grocery shopping. 1. Dice onion and tomato. Toss in a hot pan with oil and cumin seeds, crushed garlic, finely chopped chillies, and other spices to taste. 2. Cook until the onion is clear. 3. With a fork, whisk the 3 eggs in a separate bowl. Tip into the pan with the rest and a little salt and pepper. Serve on toast, or I prefer rolled into a wrap and toasted in a panini press. 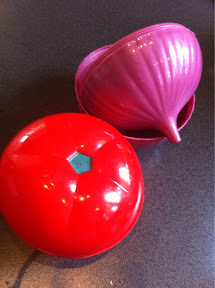 These little containers are brilliant reminders of part vege in my fridge. 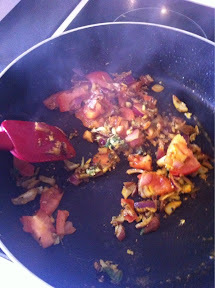 Whenever I have the tomato and onion I know I am nearly ready for eggs masala.